"My name is Harry Blackstone Copperfield Dresden. Conjure by it at your own risk. When things get strange, when what goes bump in the night flicks on the lights, when no one else can help you, give me a call. I'm in the book." A horror/fantasy/mystery series of novels, fifteen and counting plus associated short stories and comic miniseries and the like, by Jim Butcher. Harry Dresden is a wizard and private detective operating out of modern day Chicago (he's in the phone book under "wizards"; surprisingly, he's the only entry), and reluctantly hired by a special police task force as a consultant on supernatural crimes. The Genre Savvy protagonist cracks jokes about the Urban Fantasy-Dungeon Punk setting and the tropes it uses. Harry meets a wide variety of characters in the series, including Karrin Murphy, the Action Girl cop who's aware of the city's supernatural underworld; Bob, a spirit of intellect who lives in a skull—human-shaped ghost in the television series—is Harry's literal Magical Computer; Michael Carpenter, a modern-day paladin wielding a holy sword; Billy the Werewolf and his pack of Alphas (a group of young heroic wannabes); Thomas Raith, the Loveable Rogue incubus White Court vampire; Harry's on-and-off love interest reporter Susan Rodriguez; and Molly Carpenter, Michael's oldest daughter and Harry's apprentice. Like many detective stories, Harry meets a ridiculous number of femmes fatales, crime bosses, and hired goons, which is frequently lampshaded in the series. Novels 1 - 9 have been collected in 4 different omnibus editions; books one and two have also been published in comic form. Side Jobs. A collection containing eleven of the Dresdenverse short stories. 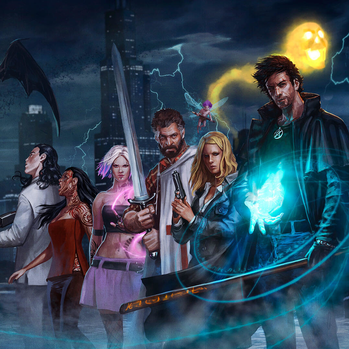 The Dresden Files were adapted into a short-lived television series on the Sci Fi Channel. A tabletop RPG, written from the characters' perspective, appeared. It used FATE Core. A second edition, Dresden Files Accelerated, using FATE Accelerated, appeared later. A cooperative card game which funded on Kickstarter at over $500,000. Word of God says that the series will have at least twenty books, which will then be capped off by an apocalyptic trilogy. Because, to quote the author, "Who doesn't love apocalyptic trilogies?" In August 2011, he hinted that the titles of the final three books would be "Stars and Stones," "Hell's Bells," and "Empty Night," because "they're called curses for a reason." There is also a planned Young Adult Literature spinoff series centered on Dresden's daughter Maggie and dog Mouse. The recap page is under major construction, so help with it would be appreciated.